A new report urges a comprehensive reworking of the city’s bus network. In 2002, New York City Transit recorded some substantial bus ridership numbers as 762 million people paid to ride the bus. It’s been all downhill since then, as only 650 million people used buses last year. Meanwhile, over the same period of time, New York City’s subway ridership has grown from 1.413 billion rides to 1.762 billion last year, and the population of the city has grown by around five percent. When it comes to buses, something isn’t working. This isn’t, of course, a new development. A few weeks ago, a NYC DOT report showed how slow travel speeds, among other issues, has led to less reliable and less popular bus service, and we’ve seen how some fairly minor enhancements to bus service — dedicated lanes and pre-board fare payment — can reduce travel times. Now, a coalition of transit advocates and New York City politicians are putting pressure on both the city and MTA to do something to improve bus service and prioritize the bus network. In a report issued last week called “Turnaround: Fixing New York City’s Buses” [pdf], the Transit Center, Riders Alliance, Straphangers Campaign and Tri-State Transportation Campaign have called for a redesigned bus network with service enhancements and best-in-class infrastructure including pre-board fare payment and dedicated street space. It’s almost revolutionary for New York but standard practice the world over. Full-scale implementation should combat the causes that have depressed bus ridership over the past decade and a half, but it will take a multi-agency effort across city and state agencies to see through. The decline in bus ridership over the past 14 years highlights the flaws in the city’s approach to building a bus network. The second section focuses on fare payment and boarding. Obviously, a tap-and-go system will significantly reduce boarding times if a pre-board fare payment system for all local buses is too costly. All-door boarding would reduce station dwell times as well. (The Riders Alliance recently issued a different report raising concerns with the MTA’s next-generation fare payment plans that could have ramifications for buses as well.) Continued investment in low-floor buses should improve the boarding process as well, the report noted. Next, the report urges the MTA to change the way it dispatches and controls buses that are en route to ensure buses arrive on schedule and avoid bus bunching. In addition to dispatching buses on time, the MTA should hold buses en route to improve service. This is a bit of a controversial recommendation as it could lead to delays for passengers during their travels, but the coalition feels a more proactive, headway-based control process should improve service for everyone. Dedicated lanes and signal prioritization can help speed up the city’s notorious slow buses. Finally, in a recommendation that would overhaul the way buses interact with the streets, the report urges a massive expansion of dedicated lanes, a renewed focus on bus bulbs and boarding islands to “eliminate time spent weaving in and out of traffic,” signal prioritization and queue-jump lanes for buses. These changes would require DOT and the MTA to collaborate and would likely require authorization from Albany as well. It’s politically tricky but not impossible. And yet, while an expansive coalition of New York City politics voiced their support for these bus turnarounds, Gov. Andrew Cuomo, the Grand Poobah of New York State politics, in comments to Politico New York, dismissed bus problems with a wave of his hand a complete lack of understanding. “If people in Manhattan are choosing to jump on the subway because the subway is faster, because there’s traffic that a bus has to deal with — that’s not an imprudent choice, right?” Cuomo said. In response to the report, the MTA noted that it is in the process of implementing some of these upgrades and that the agency has undertaken certain studies regarding specific routes. But overall, the MTA, DOT and city and state officials need to engage in a concerted effort to reroute and redraw bus routes while improving the infrastructure upon which buses rely. If they don’t, ridership will continue to decline, and buses will forever remain stuck with the stigma of being a second-class transportation option. Agree with everything here but without one more thing I still will almost never use the bus(fyi – been here 5 years and I’ve been on an MTA bus twice). High accuracy GPS on every bus and an open API so someone can build a really good app around it that will tell me exactly where my bus is and give me a good idea of when it will get to me stop. It’s called Bustime. I’ve been using it for years now, and yes, there are a bunch of good third party apps with it as well. For the most part, it’s now integrated into Google Maps as well, so if you already use that, you don’t need anything else. However, I will say at least in my area, it does seem to fail the criteria of “GPS on every bus” as there are often inexplicable ~30 min gaps in indicated service, but buses come and buses go. I remember that being an issue when DC rolled out Nextbus. Operators would forget to turn it on or log in. Not sure whether that’s the issue here. I understand all the different aspects to improve bus service, but one thing they can do right now is start reducing the number of bus stops. Some stops are 2 street corners back to back, and no one is at one and plenty of people at another. And NYC’S watered down version of BRT needs to be expanded to more lines, and other lines need to be true BRT to have a greater efficiency. Let’s agree that bus speeds in certain sections of Manhattan, and in some of the other boroughs are indeed a problem. Some even describe the problem as “being able to walk faster than the bus”. This may be true for some particular streets or situations – however there are plenty of places where it is impossible to catch the very same bus by walking to next bus stop. There are many places where the buses are NOT SLOW, even if the buses may not be frequent. Missing the bus means that you’ve MISSED THE DAMN BUS!! Please do not let “planning by anecdote” become the rule. There are many suggestions for “improving bus transit” from limiting or removing bus stops, making bus stop distances longer, eliminating bus routes, and more suggestions that I can list. Then there are folks who strongly support a particular set of problem solutions – crying for SBS everywhere, or only “pure BRT”, etc. a) Some suggestions and responses while surely appropriate for some places – just might not be appropriate for other places and in fact could make transit WORSE for local riders. b) A “one-size solution” can in fact be no solution at all – making the problems worse for the many. c) The planning process for improving bus transit has to – indeed must look closely at local conditions and situations. If one wants to call that “comprehensive planning” with a view toward understanding local issues, concerns and goals one wants to achieve then fine. Do I have an answer for slow bus speeds along certain streets or sections of Manhattan? No! I do not have ONE answer. I just would not start from a birds-eye view of Manhattan, and then start to make suggestions from only that viewpoint. Or for any other borough, neighborhood, or section of the city. I’d tailor suggestions and improvements to the particular sections, areas or neighborhoods where real local improvements on the ground can be made. This is one of those times when there is more than one answer to a problem. The obvious solution is to replace all the busses with more subways that we won’t pay for. Based on your criticism here, I assume you haven’t read Ben’s post, the report he links to or any analysis of best-in-class bus networks. This is just another not-really-related word vomit comment from you. Who is planning by anecdote here? I think this might actually be a copy/paste, because he has posted this screed about “planning by anecdote” on previous bus threads. Thank you for your very intelligent comment which is why VLM didn’t like it. People love to look for supimplistic solutions and panaceas not realizing the complexity of the situation. However, as reports go, this one is better than most. It is the only one I have ever seen other than stuff I wrote that names an outdated bus route structure as a reason why people shun buses. I have been harping on that for over forty years when routes were still outdated. 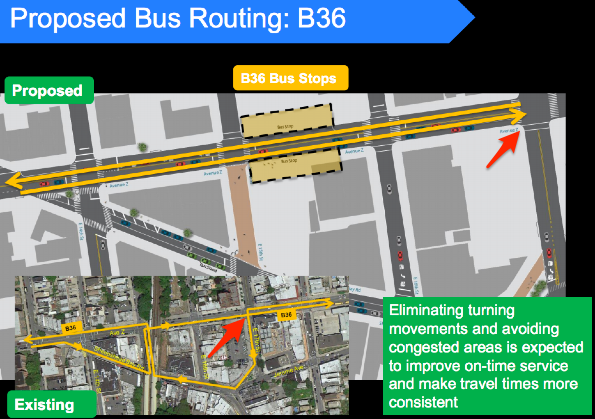 The MTA’s practice of new shuttle routes at 30 minute headways, splitting long routes and creating SBS does not address this problem of service gaps, indirect routes and unnecessary transfers. The only thing more important than routing is service reliability. Slow bus speeds are primarily a reason in Manhattan and lowering speed limits on arterials makes buses even slower. Actually fewer people than that paid to ride the bus in 2002, and it has been all downhill since before then. The introduction of Metrocard free transfers pushed up bus ridership in the short run, but then the long-term decline re-started. The bus has lost riders to the subway, to car services, to bicycles and now to Uber. And part of the change is generational. A generation of city dwellers, especially women, got used to taking buses when the subways were dangerous and taxi drivers better paid. That generation passed on. And while transit workers have become richer relative to most New Yorkers, mostly due to an increase in the cost of their retirement benefits, most for-hire car drivers have become poorer relative to other New Yorkers, as taxi-jobs were replaced by self employment, the government held down taxi fares more than transit fares, and native born drivers were replaced by immigrants. This is as good a summation as I’ve seen. It’s a long-term decline that is generational, something that I’ve seen, yes, anecdotally, in riding the bus on the east side of Manhattan. I also did some work years ago as a graduate student at NYCT and was unable to draw any correlation between demographics and declining bus ridership, at least at the neighborhood level, and thus just chalked it up to a cultural change as you’ve suggested above. It may also be partially geographical — more people with actual jobs in Manhattan living in places within walking distance from the subway. More retirees in houses that required a bus to the subway. Then there were the express buses to politically influential neighborhoods that also had subways. That people were willing to pay more, and the government was willing to provide such a deep subsidy, says something. Basically, I think they have to get bus speeds up to 10 mph — including tops, lights and traffic — for buses to be a choice mode. That would require many of the changes discussed here in recent posts, and perhaps in the report. They’d still have the image issue. But if the service was good enough, they could work on that. Yeah you can see this generational/cultural change at work on the east/west buses through central Brooklyn. The B52, B25, and B26 all serve Clinton Hill and Bed-Stuy, but their ridership is primarily older in age and in tenure in the neighborhood. Of these, the B52 is the farthest from the A/C on Fulton as it runs through Bed-Stuy, but at it’s farthest, it is only about a 15 minute walk from the A/C. In older times, if you lived nearer to Gates, you’d get off Downtown Brooklyn and get the bus home. Today, maybe you just stay on the subway. It’s faster, and crime isn’t the problem it once was. Why wait possibly 15 min for the bus, if not because it’s safer? I think if you break it down by route, people who take the bus as a necessary leg in their journey (ie. Utica Ave), these routes are not declining in ridership. But the routes set up duplicating or nearly paralleling subway service are probably declining steeply. To illustrate your point, lets look at a few bus routes. The M104 & the Q60 literally run on top of a subway line while the Q23 runs n/ s connecting several subway lines & connecting several neighborhoods from Corona to Rego Park including Forest Hills. The question is not how do we fix the buses – the question is how do we service each rider best? For this attention should be paid to each line with individual solutions. *users should not have to stand exposed to the elements while waiting to transfer between buses or the subway and buses – build roofed structures that cover and enlarged area – not just tinny bus shelters that can fit 5-8 people. The flaw in this plan is that the MTA would then lose the ability to tell if 90 percent are transferring to the subway. Tap and go is the way to go. Making the crosstown buses free should definitely be revisited. It would be so much cheaper than the line-by-line SBS treatment. Some of the crosstowns should be cancelled, because they’re only modestly faster than walking. They could be replaced with a free or pre-paid limited stop bus making at most five stops crosstown in Manhattan. Manhattan is about 2.5 miles across; if you can walk at all, you can walk a max of 1/2 and an average of less than 1/4 mile. If that’s too much, you are eligible for Access-A-Ride, which is a pain but could be converted into a taxi allowance for trips within Manhattan. No. 800 meters is not the right spacing for city buses. The right spacing is 400-500 meters. Too much farther and the walking distance will eat the entire savings coming from faster speeds. Think about it this way: a 2.4 km trip, with the current North American spacing of 200 meters, involves making 11 intermediate stops. Going up to 400 meters means killing 6 stops and adding an average of 200 meters of walking distance (100 at the origin and 100 at the destination), which is a good tradeoff. Going up to 800 meters means eliminating 3 more stops and adding another 400 meters of average walking distance – twice the cost, half the benefit. Now, you may ask yourself why subways have sparser stops. This is because they’re faster, so the time cost of each station stop is higher. People also typically use them for longer trips, and all else being equal, longer average trips correspond to longer optimal stop spacing (think why). Some buses have routes that almost appear intentionally designed to reduce ridership, like doing four left turns in a half mile. Thats a nationwide issue, not just NYC. In Boston, the Silver Line BRT route manages to stop at the same station twice in the same direction (world trade center). It would be funny if it weren’t so idiotic. Something something malice stupidity quote. In some cases it has to be intentional suppression of ridership. From the MTA’s perspective, those four lefts are ideal. For them, the ideal bus goes in circles several times per route, thus requiring more buses, more drivers, more line supervisors and more management per route, making the managers irresponsible for a larger organization and thus deserving of a raise. Routes of course must never be dropped, because the complainers are the majority and those paying are a minority. The intent of this appears to be so that the bus can stop directly at the Sheepshead Bay subway station instead of half a block away as it would if it remained on Avenue Z. But, yeah, that’s the sort of thing that made sense in an era when the streets were unsafe and having to walk half a block from the subway station to the bus stop could be seen as dangerous. By today’s standards the benefit of dropping people off right in front of the station entrance instead of 200 feet away from it is not worth that circuitous routing slowing the bus down. How many people use the bus to get to the subway stop? Making them walk a block slows down their trip. I think the right question is, does the time saved by eliminating the turns outweigh the time spent walking a short distance? MTA Staff Summary: Approximately 2270 weekday transfers from subway to B36. If we assume 2270 in the other direction, that is 4,540 per weekday. If we assume Saturday and Sunday would equal one weekday, that would be 4,540 X 6 or 27,000 a week or 1.4 million passengers a year. I would think that number would justify buses directly serving the subway and not making riders walk an extra 370 feet twice a day during bad weather, especially when DOT provided no evidence to show buses were slowed down more than one minute or two. The goal is to make bus transportation convenient not more unnecessarily inconvenient by placing cabs in front of the station and asking bus riders to walk further. A physics professor at my college once remarked that if something cannot be measured quantitatively, it doesn’t exist. What distressed me most about the “Turnaround” report was the utter lack of quantitative analysis, let alone verifiable data. Here is some data I was able to obtain from publicly available sources that should shed some light on some of the cures being proposed. On a typical weekday (20 Jun 2016), the MTA scheduled approximately 50,000 individual non-express bus trips. This derived from the static GTFS data that anyone can download from the MTA site. These included 43,683 local bus trips; 3417 ltd bus trips and 2803 SBS bus trips. The locals were scheduled to travel a total of 273,838 miles; the limiteds 27,212 miles and the SBS 21,640 miles. The locals were scheduled to make 1,764,570 stops; the limiteds 115,598 and the SBS buses 52,054. The scheduled run time for the locals was 33,520 hours; the limiteds 3511 hours and the SBS buses 2201 hours. The derived parameters are: 8.1, 7.8 and 9.8 mph for the locals, limiteds and SBS, respectively. That’s not a mistake, citywide the LTD buses are slower than than the locals. Another way of expressing the same metric is: 7.4, 7.7 and 6.1 minutes per mile for the local, limited and SBS buses respectively. Another derived parameter is: 0.16, 0.24 and 0.44 miles between stops for the local, limited and SBS buses respectively. A glance at the NTD shows in 2014 (latest data) that NYCT Bus logged 1,588,569,505 passenger miles and 762,582,618 unlinked passenger trips. The same figures for MTA Bus are: 349,659,733 and 125,581,237. The totals for both are: 1,938,229,238 passenger-miles and 888,163,855 unlinked passenger-trip. The derived parameter is: 2.18 miles/trip. Let’s compare how long will it take the average passenger to make that 2.18 mile trip, via local, limited or SBS bus. Included will be walk to /from stop @ 3mph (20 min/mile) and bus travel time for 2.18 miles. For the local the figure is: 0.16*20 + 2.18*7.4 = 19.3 min. For the limited: 0.24*20 + 2.18*7.7 = 21.6 min. For SBS: 0.44*20 + 2.18*6.1 = 22.1 min. Does the mantra that we need faster buses making fewer stops seem realistic from the rider’s perspective? The flaw with this analysis is that it assumes the distance between people’s destinations and the nearest bus stop is evenly distributed. In the real world, it isn’t. For one thing, anyone who transfers from the bus to the subway is guaranteed to not have a longer walk at one end of their bus ride because the bus stop that’s at the subway station isn’t going to be one of the ones that is eliminated. Likewise, some cross streets will generate more trips than others. M15 SBS for example deliberately stops at Houston, 14th, 23rd, etc. because people are more likely to be destined for somewhere on one of these major streets than somewhere on one of the lesser streets in between. That’s an interesting hypothesis. Can you demonstrate its validity by citing verifiable data that support it? The problem I alluded to in my first paragraph is that there is too much speculation and too few quantitative measurements that support them. The existence of bus riders transferring to the subway is not speculation – it is a well known feature of the MetroCard. Alas, the turnstile data on MTA’s website does not include any numbers on transfers, and I have not been able to locate any stats on bus-subway transfers elsewhere. The effect of major versus minor cross streets may be even more difficult to quantify since the MTA does not (and has no way of) keeping track of where exactly people get on and off of buses. Nonetheless, these are potentially significant variables that you have not accounted for in your analysis, which may well skew the results. Raise the speed limit to 30. Ever since BDB’s Vision Zero, buses drive as slow as possible and stop at green lights and wait for them to turn red. Sounds like bus drivers running ahead of schedule. Maybe schedules need to be updated. Speed limits have almost nothing to do with average bus speed. Stop spacing, MetroCard queueing, light timing, double-parking, and many other factors are slowing down buses, which spend almost no time moving at or near 25mph. Gee, how nice to see that the governor is so concerned with people in Manhattan. Meanwhile the people in the other four boroughs are screwed, because the subways are designed to get people in and out of Manhattan only. If you want to travel within the Bronx, Brooklyn, Queens, or Staten Island, you have to take a bus. But, as usual, we don’t count…. And very few buses travel between boroughs (e.g. Queens and Brooklyn), the only reason I can imagine being that routes haven’t been updated in 100 years. And that was the report’s major finding and for that it deserves credit. It is the first report I have read to acknowledge something I have been complaining about for over 40 years now.